Kwoiek Creek is a 49.9 MW, run-of-river project located on the lower reaches of Kwoiek Creek, a tributary to the Fraser River, approximately 14 km south of Lytton, British Columbia. 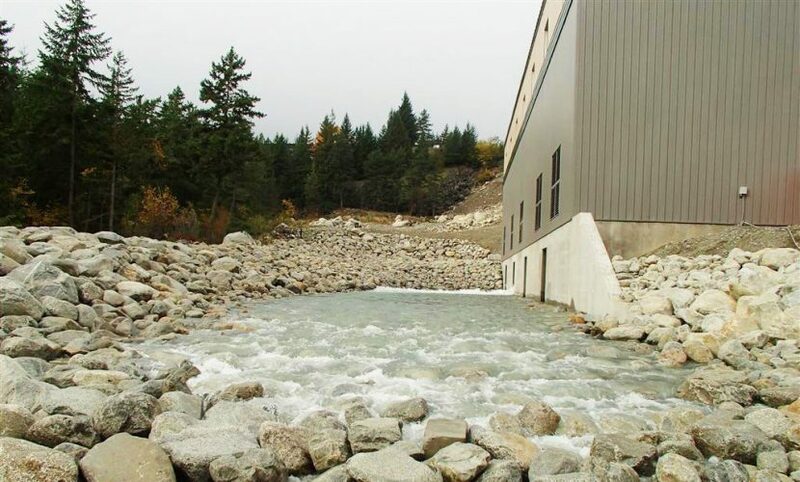 Kwoiek Creek includes a water diversion and intake facility, a buried penstock and a powerhouse located on Kanaka Bar Indian Band’s Whyeek IR No. 4 near Lytton. Kwoiek Creek also includes a 71 km-long, 138 kV transmission line to transmit electricity generated by the Project to the BC Hydro’s Highland Valley Substation near Mamit Lake. The Kwoiek Creek Hydroelectric Project, operating under a gross head of 564 metres and a maximum design flow of 13.5 cubic metres per second, produces an average of 215,000 MWh of electrical energy per year. The Project was subject to review under both the BC Environmental Assessment Act and the Canadian Environmental Assessment Act. Pursuant to the Canada-British Columbia Agreement for Environmental Assessment Cooperation, a coordinated, cooperative assessment of the Project by provincial and federal agencies was conducted. The provincial EA Certificate for the Project contains 74 commitments that must be implemented throughout various stages of the project. – Providing fish passage around the diversion structure. – Maintaining in-stream flows to protect fish and fish habitat. – Developing mitigation/compensation, access management and monitoring plans in consultation with regulatory agencies. The Kwoiek Creek plant has been granted with ECOLOGO® certification, the only independent recognized environmental standard, for its reduced impact on environment. The developer of the project is Kwoiek Creek Resources Limited Partnership (“KCRLP”). KCRLP is an equal partnership between the Kanaka Bar Indian Band and Innergex. The KBIB is a member of the Nlaka’pamux Nation, within whose traditional territory the Project is located. The powerhouse, transformer and several other elements of the Project are situated on reserve lands of the KBIB. – new “green power” of approximately 215,000 MWh per year.